These lovely glass mosaics add interest and elegance to the environment surrounding them. 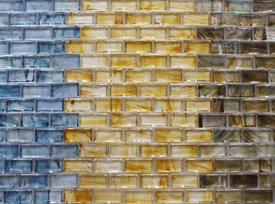 From bold green and blue tones, to muted brown, blue and yellow tones or classic white, you’ll find a mix of color to go with any décor, whether your intent is for the glass tile to accent, or blend in with the surrounding environment. Bohemia’s opulent color palette has been especially loved in pools and hot tubs, but is just as easily suited for interior walls, kitchen countertops and backsplashes to light residential floors. This glass tile line also comes paper-face mounted, meaning you’ll get maximum contact between the tile and the setting material, ensuring a durable installation that can last for years to come. Choose a mini-subway or brick size, or the 5/8" x 5/8" square size. Subtle shade variations within each sheet are inherent as part of the character and unique beauty of this glass tile line. Clearance item: 150 sheets available does not qualify for free shipping.